An ancient princess is awakened from her crypt beneath the desert, bringing with her malevolence grown over millennia, and terrors that defy human comprehension. What starts in the 12th century with buried knights ends with the return of an evil forgotten princess who made a pact with Set, the Egyptian god of the dead, for the purposes of…well, just being plain evil. Mummy movie villains can't ever have a relatable human side to them. They just can't. 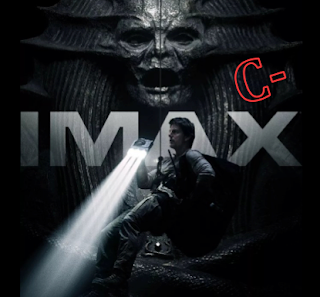 When a small-time army-enlisted conman “Nick Morton” (Tom Cruise) accidentally frees the evil goddess, things go from bad to worse for the modern world, and for “Jenny Halsey” (Annabelle Wallis), an army archeologist and Nick's love interest. There are no bad performances in The Mummy, but the characters don’t come alive for us (pardon the pun). We don’t care about them and the plot itself doesn’t ring credible (even by bad mummy movie standards). What does ring credible is model and actress Sofia Boutella as “Ahmanet,” the evil force behind everything. She owns her role in a stunning way. The only thing attractive about the movie (next to Sofia) is the way in which it gets into its story and revisits elements of it in a consistent manner. Yes, it is a very watchable bad movie. Beyond that, the humor and ongoing comic relief is tiresomely unfunny. But since the plot never had much credibility to begin with, we tend to just ignore the screechy mummy-zombie transformation, which don’t scare us or strike us an anything but bargain-basement scifi stuff. There was still redemptive possibility up through the halfway marker, but when Ahmanet summons dead knights to serve her in killing (they wouldn’t because they were Christian when they were alive, not Egyptian), things get even stupider. Russell Crowe plays “Dr. Henry Jekyll.” His contribution can be said to serve as an honorable mention due to the strength of the performance, but the attachment of his character in this movie can’t be said to do anything for it. As with many modern films and their action scenes, nobody really ever gets hurt and villains throw people out of range with super-human strength rather than just kill them when they have them up close. People take headers into solid steel objects and yet never suffer any crippling injuries from the experience. The most impressive line in the movie comes from Halsey as the group first finds the tomb: “This isn’t a tomb, it’s a prison!” How enticing! But things are pretty much downhill from there.